The AWS A5.12 Specification for Tungsten states that "Thorium is radioactive and may present hazards by internal and external exposure...If alternatives are available, they should be used." 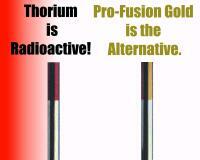 Pro-Fusion 1.5% Lanthanated (Gold Color) replaces 2% Thoriated tungsten in AC or DC welding without weld program changes while providing easy arc starting and longer electrode life. Free samples available upon request.